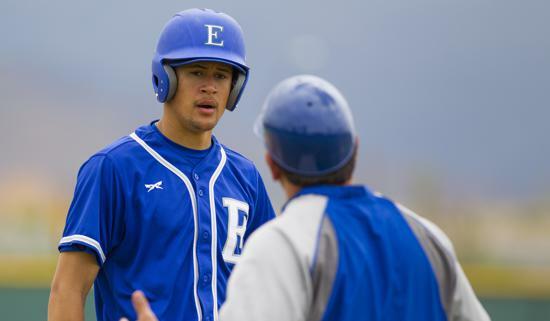 Eastlake’s Tre Brown, sidelined as a pitcher this season, has contributed as a pinch-runner for the No. 5-ranked Titans, who began the week with a 12-3 record. CHULA VISTA  It’s never easy to predict how high school pitchers will perform at the next level. Yet no matter how volatile the health of a young arm, there’s no shortage of pro teams and college programs willing to take a flier on the right combination of stuff, talent and potential. Eastlake High senior Tre Brown checks all those boxes. “He’s overpowering, smart and very finesse,” said Titans baseball coach David Gallegos. Brown, who has accepted a scholarship to San Diego State, has been held out so far this year with elbow tendinitis, a condition he attributes to his mechanics. It’s something he’s dealt with on a yearly basis. Now it’s caught up to him, Gallegos said, and Brown has no option but to change how he’s pitched his entire career. At the start of April, the timeline called for the 6-foot-3 right-hander to return to the mound within about two weeks. He was doing light throwing at the time, with the workload increasing as he gained strength. Brown described his mechanics as being too long, meaning he was throwing with more effort than necessary. He remains confident that his work with the coaching staff and revamped mechanics will allow him to be the dominant pitcher many think he can be. “I’m throwing with no pain, and you should expect me going out and throwing harder than I ever have,” Brown said. One person betting big on Brown’s potential is San Diego State coach Mark Martinez, who managed to snag Brown away from Ivy League schools and other top baseball programs such as North Carolina and Stanford. Brown, who carries a 3.95 grade-point average, made five starts last season for Eastlake after transferring from Olympian following his sophomore season. He’s left an impression with South County coaches during his brief time on the mound. Martinez is aware of Brown’s health history, calling it a concern whenever any young pitcher is having elbow discomfort. The coach went on to detail how he believes SDSU can be a destination for high school pitchers trying to straighten out their mechanics and stay healthy. “We have a system that takes care of (pitchers) and we don’t put them in harm’s way when they’re here,” Martinez said. “We manage what they do as far as competitive throws throughout their careers here. We’re very careful with it. We make sure that kids are treated properly and we don’t abuse them.